The Moscow Metro is probably the most magnificent subway of the world. It is not only beautiful, but also cheap, reliable and runs on time. In Moscow the Metro is often the fastest way to get around the city compared to other means of public transportation, taxis or driving. During rush hours, metro trains run every one to two minutes. 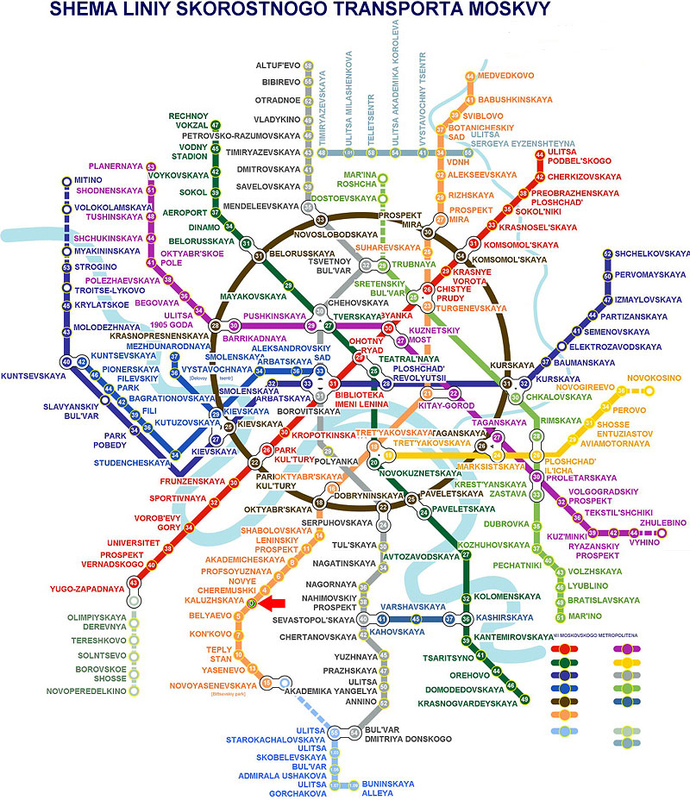 Discussions about building an underground railway in Moscow started in 1902. Back then, most people were shocked and the issue caused considerable dispute in the media. In the early 1930s the population of Moscow grew rapidly. So it was decided to assign two important communist leaders to manage the construction of the Moscow Metro: Lasar Kaganovitch, the then-Minister of Transport of the USSR, and Nikita Khrushchev, who later became General Secretary of the Communist Party of the Soviet Union. Construction works started on November 7, 1931, the October Revolution Day. The project turned into a matter of prestige for the entire Soviet Union. Thousands of soldiers and volunteers helped professional workers at construction sites. Best Russian artists created interior decoration of metro stations. Being in constant competition with the West, Stalin was eager to build not just another subway, but the best subway of the world. Even beneath the ground everyone should sense the power of the Soviet state. 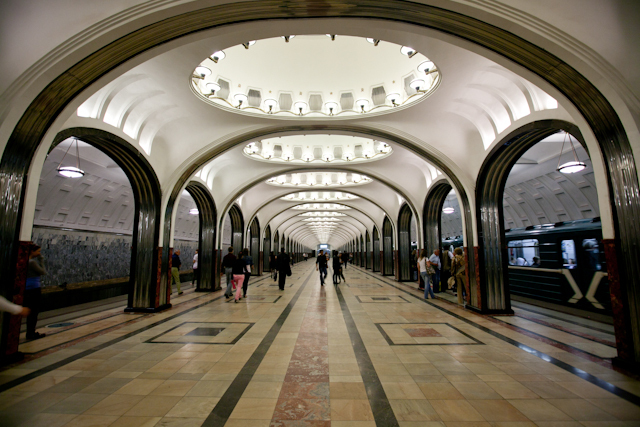 The first section of the Moscow Metro – 11 kilometres with 13 stations – was opened for operation already in May 1935. Trains ran between Park Sokolniki (Russian: Сокольники) and Park Kultury (Russian: Парк Культуры). 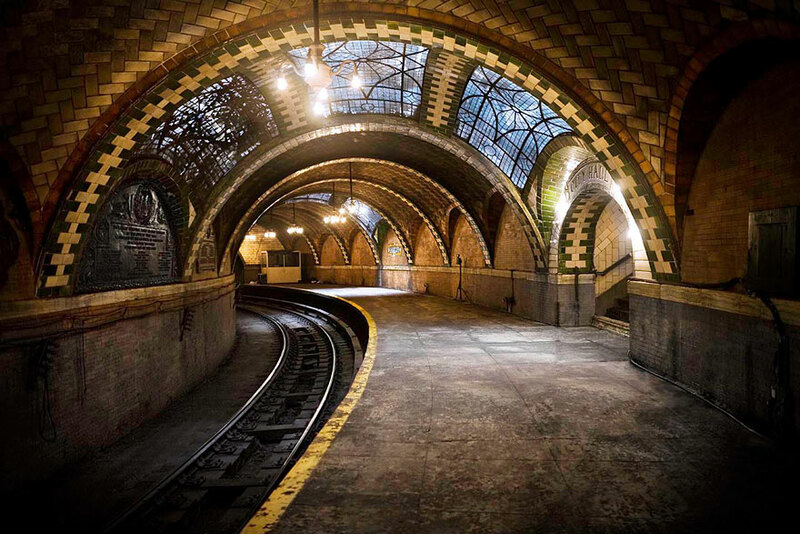 Magnificent stations could compete with Royal palaces: huge halls were decorated with chandeliers, mosaic, statues and columns made of marble or other precious stone. Each metro station featured a different theme. The construction of the Moscow Metro was going at a good pace. In 1939 it had already 22 stations. Construction works didn’t stop evenduring the Second World War. At that time the Metro was also used as an air raid shelter. The station Chistiye Prudy(Russian: Чистые Пруды) was turned into General Staff Headquarters. The Moscow Metro carries about 7 million passengers a day. That is why the trains and metro stations are very crowded especially on weekdays. The best time for a sightseeing tour in the Metro is early morning, late evening or Sunday. The Metro in Moscow has 12 lines with 197 stations. The route length is 329,2 km (about 203.19 miles). The deepest station (84 m / 275.59 ft) Park Pobedy (Russian: Парк Победы) belongs to the longest (45,1 km / 28 miles) line called Arbatsko-Pokrovskaya (Russian: Арбатско-Покровская). The Moscow Metro is prohibited smoke and the consume of alcohol. Bicycles are not allowed in the Metro, except for folding bicycles and kids’ bikes. Taking photos or filming in the Moscow Metro is permitted without using special equipment such as tripods, lights, etc. It is not possible to enter the Moscow Metro without a valid ticket. To get in, one has to insert the ticket into a turnstile. The rides are paid for with electronic or paper cards. Tickets can be purchased at Metro ticket offices or at vending machines. The choice of a ticket depends on how often you want to travel by the Moscow Metro.